Only 18 of 100 students will graduate high school, enroll in post-secondary, complete that degree and immediately start work. It’s a number that business and education leaders said must change. 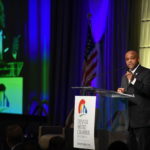 Through partnership of the public and private sectors and an innovative initiative being supported by the Chamber and Mayor Michael B. Hancock, that change is possible. That initiative is Prosperity Denver. It would fund scholarships and support services through a .08 percent sales tax increase – less than a penny on a $10 purchase. Those eligible (18 to 25-year-olds who hold a high school diploma or GED and have lived in the city for at least 36 months) would be reimbursed for their education, from certificates and apprenticeships to two and four-year, once they complete that education. Brough said this may be a model for how communities across the state can get more students to and through education. That matters because by 2020, 74 percent of jobs in Colorado will require some post-secondary education. She and a panel of business and education leaders shared their strategies for building that pipeline while also recognizing that 85 percent of jobs that will exist in 2030 haven’t even been invented yet. Build a strong foundation. 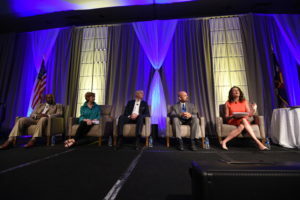 Because tech and AI are rapidly disrupting industries and jobs, Colorado Community College System President Joe Garcia cautioned on focusing too much on specific job skills and instead focusing on skills that will transfer in a knowledge-based economy. “We need to make sure we’re providing students with a foundational background,” he said, adding that building a career “takes a different kind of training” than finding a job. Scale up. While access to downtown businesses can be challenging, Aurora Public Schools has found success engaging local small business owners, said Superintendent Rico Munn. “For us it’s about accessibility and scalability,” he said, adding that their students all have a plan for their education and future goals. Hancock and Golden Mayor Marjorie Sloan celebrated the accomplishments of the region but urged forward-thinking solutions for challenges ranging from affordable housing to transportation. 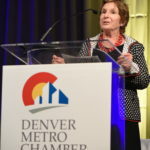 Sloan, who also chairs the Metro Mayors Caucus, applauded the Chamber’s work to address the state’s crumbling transportation system and urged others to join the Chamber and the mayors in supporting Let’s Go Colorado – an initiative that would fund state, local and multimodal transportation solutions through a .62 percent sales tax increase. Hancock celebrated gains made in the city after the recession. Since 2011, when he became mayor, 90,000 jobs and 6,600 new businesses have been created. And the city continues to focus on greater equity in access to great jobs, a strong talent pipeline, increasing woman and minority-owned businesses, affordable housing and focusing on mobility. “It is time that we as a state get serious about our roads,” Hancock said. Denver County Judge Gary Jackson and Denver Mayor Michael B. Hancock. 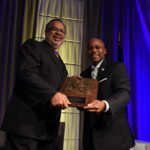 Recognizing his leadership, work to improve the community and efforts to fight for justice and equal opportunity for all, Denver County Judge Gary Jackson was named the recipient of the Monte Pascoe Civic Leadership Award – the first jurist to receive the award. Prior to taking the bench, Jackson practiced law for over 40 years. His practice included representing attorneys and judges in attorney regulation matters, employment litigation and complex personal injury litigation.